An excellent site for Bolivian Catholics in-country and abroad! This is wonderful for Catholics, and it also helps the environment [as you don’t need to use a hard copy or print it] . By using it this way, you could also help save some money at those parishes where their parishioners have smart phones, so your priest could buy less of those or now they will reach all attendees. Probably many of you don’t know that the Sunday guide for mass is paid by the Parrish who wants it. Sometimes, there are fewer than those people attending… Well, this site offers the opportunity to download ahead of time, they have pdf files for several Sundays in advance, so you can download them. 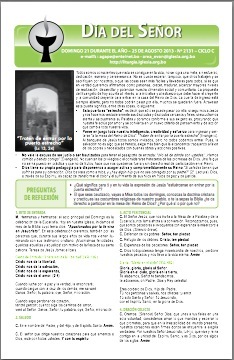 If you live abroad, and you want to attend Mass there, even in another language, you could have that Sunday’s lectures in Spanish and will be praying the same as your loved ones, back home. God bless you and have a safe, happy life! This entry was posted in Bolivia and tagged Catholic Church, religion, Sunday Service. Bookmark the permalink.